The Taj Mahal was built by Mughal emperor Shah Jahan in memory of his wife Mumtaz Mahal who died while giving birth to their 14th child in 1631. He did have other wives, but his love for her in particular was said to be profound and he took her everywhere with him. When she died, it is said that he issued a mandatory period of mourning for two years. Construction began a year after she died and by about 1653 the Taj Mahal was completed. The building also serves as a tomb for Mumtaz Mahal--and Shah Jahan as well, who requested to be entombed beside his beloved bride upon his death in 1666. The Taj Mahal took 22 years and 22,000 laborers (and 1,000 elephants) to complete. It's made entirely of white marble. As I'm aware from my reading, the building is also uniquely symmetrical (there is another story out there about the architect of this building). It's unclear, or was never discovered for certain, whether Shah Jahan came up with the idea to build the structure on his own or if, as some stories say, it was Mumtaz Mahal herself who requested the monument of their love when she was dying--but either way, without that love, we would not have this beautiful building, which just so happens to also be one of the Seven Wonders of the World (with good reason). 1.The photo shows the sacred 'OM' carved on the exterior wall of the sanctum noow occupied by cenotaphs. 2.The term Tajmahal itself never occurs in any mogul court paper or chronicle even in Aurangzeb's time. The attempt to explain it away as Taj-i-mahal is therefore, ridiculous. 3.The ending "Mahal"is never muslim because in none of the muslim countries around the world from Afghanistan to Algeria is there a building known as "Mahal". 4.Several European visitors of Shahjahan's time allude to the building as Taj-e-Mahal is almost the correct tradition, age old Sanskrit name Tej-o-Mahalaya, signifying a Shiva temple. Contrarily Shahjahan and Aurangzeb scrupulously avoid using the Sanskrit term and call it just a holy grave. 5.Tejo Mahlaya means Agreshawarar Mahadev; Lord Shiva's abode. 6.Moreover, if the Taj is believed to be a burial place, how can the term Mahal, i.e., mansion apply to it? 7.The people living around Agra are called Jats.They call Lord Shiva as Tejaji.Therefore the Linga inside the Taj is called teja Linga and the names becomes Taj Mahal. 9. The picture shows an octagonal well.Between the so-called mosque and the drum house is a multistoried octagonal well with a flight of stairs reaching down to the water level. This is a traditional treasury well in Hindu temple palaces. Treasure chests used to be kept in the lower apartments while treasury personnel had their offices in the upper chambers. The circular stairs made it difficult for intruders to reach down to the treasury or to escape with it undetected or unpursued. In case the premises had to be surrendered to a besieging enemy the treasure could be pushed into the well to remain hidden from the conquerer and remain safe for salvaging if the place was reconquered. Such an elaborate multistoried well is superflous for a mere mausoleum. 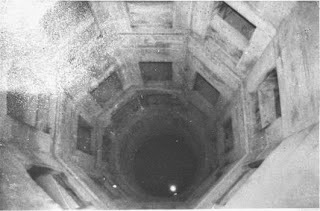 Such a grand, gigantic well is unneccesary for a tomb. 11.Prince Aurangzeb's letter to his father,emperor Shahjahan,is recorded in atleast three chronicles titled `Aadaab-e-Alamgiri', `Yadgarnama', and the `Muruqqa-i-Akbarabadi' (edited by Said Ahmed, Agra, 1931, page 43, footnote 2). In that letter Aurangzeb records in 1652 A.D itself that the several buildings in the fancied burial place of Mumtaz were seven storeyed and were so old that they were all leaking, while the dome had developed a crack on the northern side.Aurangzeb, therefore, ordered immediate repairs to the buildings at his own expense while recommending to the emperor that more elaborate repairs be carried out later. This is the proof that during Shahjahan's reign itself that the Taj complex was so old as to need immediate repairs. 12.he ex-Maharaja of Jaipur retains in his secret personal `KapadDwara' collection two orders from Shahjahan dated Dec 18, 1633 (bearing modern nos. R.176 and 177) requestioning the Taj building complex. That was so blatant a usurpation that the then ruler of Jaipur was ashamed to make the document public.
. The three firmans demanding marble were sent to Jaisingh within about two years of Mumtaz's death. Had Shahjahan really built the Tajmahal over a period of 22 years, the marble would have needed only after 15 or 20 years not immediately after Mumtaz's death. 14.Shahjahan's own court chronicle, the Badshahnama, admits (page 403, vol 1) that a grand mansion of unique splendor, capped with a dome (Imaarat-a-Alishan wa Gumbaze) was taken from the Jaipur Maharaja Jaisigh for Mumtaz's burial, and the building was known as Raja Mansingh's palace. 15.There are persons who are connected with the repair and the maintainance of the Taj who have seen the ancient sacred Shiva Linga and other idols sealed in the thick walls and in chambers in the secret, sealed red stone stories below the marble basement. The Archaeological Survey of India is keeping discretely, politely and diplomatically silent about it to the point of dereliction of its own duty to probe into hidden historical evidence. 16. The Tajmahal has a trident pinncle over the dome. A full scale of the trident pinnacle is inlaid in the red stone courtyard to the east of the Taj. The central shaft of the trident depicts a "Kalash" (sacred pot) holding two bent mango leaves and a coconut. This is a sacred Hindu motif. Identical pinnacles have been seen over Hindu and Buddhist temples in the Himalayan region. 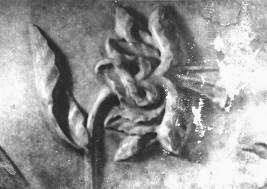 Tridents are also depicted against a red lotus background at the apex of the stately marble arched entrances on all four sides of the Taj. People fondly but mistakenly believed all these centuries that the Taj pinnacle depicts a Islamic cresent and star was a lighting conductor installed by the British rulers in India. Contrarily, the pinnacle is a marvel of Hindu metallurgy since the pinnacle made of non rusting alloy, is also perhaps a lightning deflector. That the pinnacle of the replica is drawn in the eastern courtyard is significant because the east is of special importance to the Hindus, as the direction in which the sun rises. 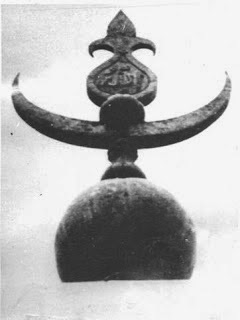 The pinnacle on the dome has the word `Allah' on it after capture which was forged by Alexander Cunningham. The pinnacle figure on the ground does not have the word Allah. 17. 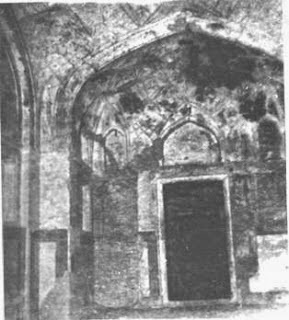 A wooden piece from the riverside doorway of the Taj subjected to the carbon 14 test by an American Laboratory, has revealed that the door to be 300 years older than Shahjahan,since the doors of the Taj, broken open by Muslim invaders repeatedly from the 11th century onwards, had to b replaced from time to time. The Taj edifice is much more older. It belongs to 1155 A.D, i.e., almost 500 years anterior to Shahjahan. 18.Well known Western authorities on architechture like E.B.Havell, Mrs.Kenoyer and Sir W.W.Hunterhave gone on record to say that the TajMahal is built in the Hindu temple style. Havell points out the ground plan of the ancient Hindu Chandi Seva Temple in Java , Indonesia is identical with that of the Taj. 19.A central dome with cupolas at its four corners is a universal feature of Hindu temples. 20. The picture shows a music house..Music houses are not needed in a mausoleum.The proximity of the Drum House indicates that the western annex was not originally a mosque. Contrarily a drum house is a neccesity in a Hindu temple or palace because Hindu chores,in the morning and evening, begin to the sweet strains of music. 21. The four large pillars standing around Taj Mahal are named wrongly as minarets because minarets start from shoulders . 22.The two buildings which face the marble Taj from the east and west are identical in design, size and shape and yet the eastern building is explained away by Islamic tradition, as a community hall while the western building is claimed to be a mosque. How could buildings meant for radically different purposes be identical? This proves that the western building was put to use as a mosque after seizure of the Taj property by Shahjahan. Curiously enough the building being explained away as a mosque has no minaret. They form a pair af reception pavilions of the Tejomahalaya temple palace. 23. Many rooms have been closed from public view even during Shah Jahan's period to protect the interior hindu images and sacred idols. 24. There are silver doors and golden railings inside that protects the sanctum. It also had nets of pearl and gems stuffed in the marble lattices. It was the lure of this wealth which made Shahjahan commandeer the Taj from a helpless vassal Jaisingh, the then ruler of Jaipur. 25.Around the cenotaph of Mumtaz are 5 perambulatory passages that were used to look over the deity. 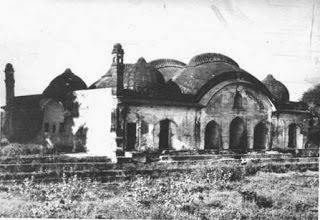 27.the picture shows Burhanpur palace where Mumtaz died and her grave is well protected in a pavilion. 28. The Taj Mahal is scrawled over with 14 chapters of the Koran but nowhere is there even the slightest or the remotest allusion in that Islamic overwriting to Shahjahan's authorship of the Taj. Had Shahjahan been the builder he would have said so in so many words before beginning to quote Koran. 29.That Shahjahan, far from building the marble Taj, only disfigured it with black lettering is mentioned by the inscriber Amanat Khan Shirazi himself in an inscription on the building. A close scrutiny of the Koranic lettering reveals that they are grafts patched up with bits of variegated stone on an ancient Shiva temple. 30.The octagonal shape of the Tajmahal has a special Hindu significance because Hindus alone have special names for the eight directions, and celestial guards assigned to them. The pinnacle points to the heaven while the foundation signifies to the nether world. Hindu forts, cities, palaces and temples genrally have an octagonal layout or some octagonal features so that together with the pinnacle and the foundation they cover all the ten directions in which the king or God holds sway, according to Hindu belief. 31. 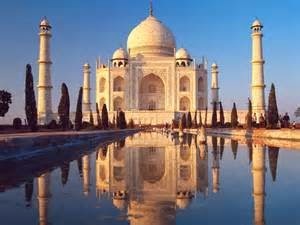 31.The cost of the Taj is nowhere recorded in Shahjahan's court papers because Shahjahan never built the Tajmahal. That is why wild estimates of the cost by gullible writers have ranged from 4 million to 91.7 million rupees. 32.Likewise the period of construction has been guessed to be anywhere between 10 years and 22 years. There would have not been any scope for guesswork had the building construction been on record in the court papers. 33. Hindu temples are often built on river banks and sea beaches. The Taj is one such built on the bank of the Yamuna river an ideal location for a Shiva temple. 34. The Tajmahal has identical entrance arches on all four sides. This is a typical Hindu building style known as Chaturmukhi, i.e.,four faced. 35.The Tajmahal has a reverberating dome. Such a dome is an absurdity for a tomb which must ensure peace and silence. Contrarily reverberating domes are a neccesity in Hindu temples because they create an ecstatic dinmultiplying and magnifying the sound of bells, drums and pipes accompanying the worship of Hindu deities. 36. the picture shows one of the 22 rooms that is sealed to public view..Its a secret room. 37.Taj Mahal is a 7 storey buildin and it contains 22 palatial rooms that face towards the river.The seventh storey is beneath because accordin to Hindu customs the seventh storey must be subterranean. 38.Below the marble plinth on the river flank lies 2 storeys in red stone.Immediately below the marble plinth lies these 22 room with ventilators. 39.A grave above Mumatz's grave is to hid the two-tier Shiva Linga that is as such seen in Ujjain and Somanth. 40. Peter Mundy, a Englishman records (in 1632, within a year of Mumtaz's death) having seen a gem studded gold railing around her tomb. Had the Taj been under construction for 22 years, a costly gold railing would not have been noticed by Peter mundy within a year of Mumtaz's death. Such costl fixtures are installed in a building only after it is ready for use. This indicates that Mumtaz's centotaph was grafted in place of the Shivalinga in the centre of the gold railings. Subsequently the gold railings, silver doors, nets of pearls, gem fillings etc. were all carried away to Shahjahan's treasury. The seizure of the Taj thus constituted an act of highhanded Moghul robery causing a big row between Shahjahan and Jaisingh. 41.Above the cenotaph of Mumtaz lies a chain where hangs a lamp now..In olden days it was used to hang a golden pitcher through which droplets of water fell continously of the Shiv Linga. 42.Bel leaves are mentioned in the court book..Its a vedic plant and is offered to Lord Shiva.A graveyard is planted only with shady trees because the idea of using fruit and flower from plants in a cemetary is abhorrent to human conscience. The presence of Bel and other flower plants in the Taj garden is proof of its having been a Shiva temple before seizure by Shahjahan. 44. Even the year of Mumtaz's death is unknown. It is variously speculated to be 1629, 1630, 1631 or 1632. Had she deserved a fabulous burial, as is claimed, the date of her death had not been a matter of much speculation. In an harem teeming with 5000 women it was difficult to keep track of dates of death. Apparently the date of Mumtaz's death was so insignificant an event, as not to merit any special notice. Who would then build a Taj for her burial? 45.The Tajmahal dome bears a lotus cap. Original Islamic domes have a bald top as is exemplified by the Pakistan Embassy in Chanakyapuri, New Delhi, and the domes in the Pakistan's newly built capital Islamabad. 46. The Tajmahal entrance faces south. Had the Taj been an Islamic building it should have faced the west. 47. Far from the building of the Taj, Shahjahan disfigured it with black koranic lettering and heavily robbed it of its Sanskrit inscription, several idols and two huge stone elephants extending their trunks in a welcome arch over the gateway where visitors these days buy entry tickets. An Englishman, Thomas Twinning, records (pg.191 of his book "Travels in India A Hundred Years ago") that in November 1794 "I arrived at the high walls which enclose the Taj-e-Mahal and its circumjacent buildings. I here got out of the palanquine and.....mounted a short flight of steps leading to a beautiful portal which formed the centre of this side of the `COURT OF ELEPHANTS" as the great area was called." 48.De Laet, a Dutch official has listed Mansingh's palace about a mile from Agra fort, as an outstanding building of pre shahjahan's time. Shahjahan's court chronicle, the Badshahnama records, Mumtaz's burial in the same Mansingh's palace. 49.Shahjahan seems to have simulated Mumtaz's burial in Agra to find a pretext to surround the temple palace with his fierce and fanatic troops and remove all the costly fixtures in his treasury. This finds confirmation in the vague noting in the Badshahnama which says that the Mumtaz's (exhumed) body was brought to Agra from Burhanpur and buried `next year'. An official term would not use a nebulous term unless it is to hide some thing. 50. A pertinent consideration is that a Shahjahan who did not build any palaces for Mumtaz while she was alive, would not build a fabulous mausoleum for a corpse which was no longer kicking or clicking. 51.The stately rooms on the upper floor of the Tajmahal have been striped of their marble mosaic by Shahjahan to obtain matching marble for raising fake tomb stones inside the Taj premises at several places. Contrasting with the rich finished marble ground floor rooms the striping of the marble mosaic covering the lower half of the walls and flooring of the upper storey have given those rooms a naked, robbed look. Since no visitors are allowed entry to the upper storey this despoilation by Shahjahan has remained a well guarded secret. There is no reason why Shahjahan's loot of the upper floor marble should continue to be hidden from the public even after 200 years of termination of Moghul rule. 52.The entire Taj complex comprises of 400 to 500 rooms. Residential accomodation on such a stupendous scale is unthinkable in a mausoleum. 53. That the Tajmahal dome has hundreds of iron rings sticking out of its exterior is a feature rarely noticed. These are made to hold Hindu earthen oil lamps for temple illumination. 54.The interior of the dome rising over Mumtaz's centotaph has a representation of Sun and cobras drawn in gold. Hindu warriors trace their origin to the Sun. For an Islamic mausoleum the Sun is redundant. Cobras are always associated with Lord Shiva. 55.There is lot of sophistry and casuistry or atleast confused thinking associated with the Taj even in the minds of proffesional historians, archaelogists and architects. At the outset they assert that the Taj is entirely Muslim in design. But when it is pointed out that its lotus capped dome and the four corner pillars etc. are all entirely Hindu those worthies shift ground and argue that that was probably because the workmen were Hindu and were to introduce their own patterns. Both these arguments are wrong because Muslim accounts claim the designers to be Muslim,and the workers invariably carry out the employer's dictates. The Taj Mahal is a magnificent structure in the city of Agra, India, which is about 203 kilometers from the capital city of Delhi. It was built over 500 years ago by a Mughal emperor, Shah Jahan. The Taj Mahal is one of the new Wonders of the World, and with good reason. It is a fascinating experience and everybody should try to see this great structure at least once. Taj is the most beautiful monument built by the Mughals, the Muslim rulers of India. Taj Mahal was built by the Mughal emperor Shah Jahan (1628-1658) and it was dedicated to Mumtaz Mahal (Arjumand Bano Begum), the wife of Shah. Standing majestically on the banks of River Yamuna, the Taj Mahal is synonymous to love and romance. The closeness to the river also met the water need for the construction and garden. The Taj Mahal is a white Marble mausoleum located in Agra, India. The tomb is the representation of the house of the queen in Paradise, and its setting was based on the palace gardens of the great nobles that lined both sides of the river at Agra India. Mir Abul Karim and Mukamat Khan was positioned as supervisors of the construction , however the architect was never mentioned by the Mogul Empire’s historians that left questions and disputes about the architect. The most reliable architect might be Ustad Ahmad Lahori, who was the architect of the Red Fort of Agra and most probably took part in the construction of Taj Mahal, which was indeed emphasised in a poem of his son Lutfullah Muhandis.